HTC recently introduced their all new Android smartphone named HTC Aria via USA mobile operator, AT&T.The new HTC Aria Smartphone runs on Google Android 2.1 OS with HTC Sense UI (User Interface).The Smartphone looks a little bit similar to HTC Incredible but is smaller in size. The all new HTC Aria Smartphone equips a 3.2-inch capacitive touchscreen display with resolution of 320×480 (HVGA) and is powered with a 600MHz Qualcomm MSM7227 processor.The smartphone packs a high quality 5MP autofocus camera but lacks an LED flash.HTC Aria handset is designed to support GSM/GPRS/EDGE and UMTS/HSPA networks. HTC Aria Smartphone Features includes 384MB RAM, 512MB internal memory, Wi-Fi, support for 7.2Mbps HSPA, Bluetooth, GPS, digital compass, motion sensors, proximity sensor, light sensor, a microSD/microSDHC card slot bundled with a 2GB memory card.The smartphone houses a 1,200mAh battery that provides almost 6 hours of life. 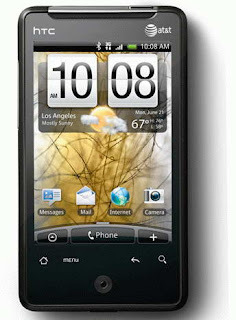 New HTC Aria Smartphone provides well support for mobile broadband with 3G speed, optical joystick and the capacitive touchscreen.HTC Aria mobile handset will be available for sale by June 20th with a price tag of $129.99 after $100 mail-in rebate and comes with a two-year contract. Tags:-Aria, AT&T, AT&T HTC Aria, HTC Aria Smartphone features, HTC Aria Smartphone price, HTC Aria Smartphone price tag, HTC Aria Smartphone specs, HTC Aria Smartphone specifications, HTC Aria Smartphone launch date, HTC Aria Smartphone release date, HTC Aria Smartphone availability, HTC Aria Smartphone details, HTC, HTC Aria, Mobile Broadband, Smartphone.